Book News: Emily Dickinson Papers Go Online, Deepening Harvard-Amherst Feud : The Two-Way Also: a new story by Haruki Murakami; Alice Munro might not retire after all; and World Book Night announces its titles. 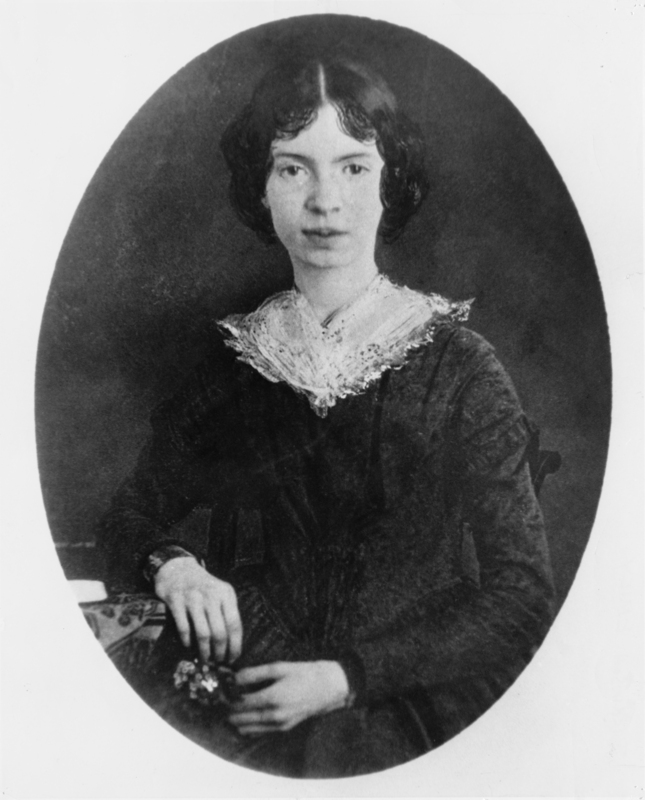 American poet Emily Dickinson, circa 1850. The Emily Dickinson Archive, launched Wednesday, gives free access to high-resolution photos of thousands of the poet's manuscripts, including envelopes or bits of paper with poems jotted on them, letters, doodles and many, many exuberant em-dashes. Only 10 of Dickinson's poems were published in her lifetime, and they were published anonymously and heavily edited. The launch of the site was colored by a dispute between Harvard and Amherst College, which hold two of the largest collections of Dickinson's papers. Mike Kelly, head of archives and special collections at Amherst College, told The Boston Globe that Harvard was unfairly dominating the project, saying, "It should say a joint project." Harvard declined to comment. The animosity between the two schools over Dickinson's papers goes back centuries. After the poet died in 1886, her sister Lavinia discovered her poems and gave them to her brother's wife to edit. When his wife worked too slowly, she turned many of them over to her brother's mistress, Mabel Loomis Todd, to edit. Todd ultimately refused to give them back to the family, and her daughter later gave them to Amherst. Dickinson's family eventually sold their papers to Gilbert Montague, a cousin, who gave his to Harvard, leading to years of competition over which collection was more legitimate. Dickinson scholar Christopher Benfey told The New York Times, "The scholarship with any major figure produces factions and divisions. But with Dickinson, the truly bizarre thing is the quarrel has been handed to generation after generation after generation." Alice Munro, the Nobel Prize-winning short story writer who has said she is probably done writing, now says she isn't so sure. She told The Wall Street Journal, "Every day I have mixed messages to myself over whether I will retire," adding, "I have promised to retire but now and then I get an idea." The third annual World Book Night, a campaign to promote reading by giving away 500,000 free books across the country on April 23, 2014, will feature 35 books, including Where'd You Go, Bernadette by Maria Semple, The Perks of Being a Wallflower by Stephen Chbosky, Catch-22 by Joseph Heller, and — in both English and Spanish — When I Was Puerto Rican by Esmeralda Santiago. Executive Director Carl Lennertz wrote in a press release, "This year's book selection is the most diverse ever, and we've increased the total number of picks this year to 35 in order to welcome in more authors and publishers. We have our first graphic novel, our first university press pick, and the first Asian-American authors." The Japanese writer Haruki Murakami published a new short story in The New Yorker. Playing with Kafka's Metamorphosis, the story begins, "He woke to discover that he had undergone a metamorphosis and become Gregor Samsa. He lay flat on his back on the bed, looking at the ceiling. It took time for his eyes to adjust to the lack of light. The ceiling seemed to be a common, everyday ceiling of the sort one might find anywhere. Once, it had been painted white, or possibly a pale cream. Years of dust and dirt, however, had given it the color of spoiled milk. It had no ornament, no defining characteristic. No argument, no message. It fulfilled its structural role but aspired to nothing further."